Vegans do not eat any foods that come from animals, so vegan "cheese" is a cheese product without milk or milk products, usually derived from soy, rice or oat milks, with gums, starches or tapioca added for texture. Some cheese alternatives include casein, a protein obtained from cow's milk, so beware -- not all cheese alternatives are truly vegan products. The American Heart Association acknowledges vegetarian diets as lower fat and cholesterol than diets that include animal products. They also conclude that this diet lowers the risk of obesity, heart disease, high blood pressure, diabetes and some types of cancer as well. Vegan cheese brands differ slightly, and different types of cheese have varying nutritional facts as well. 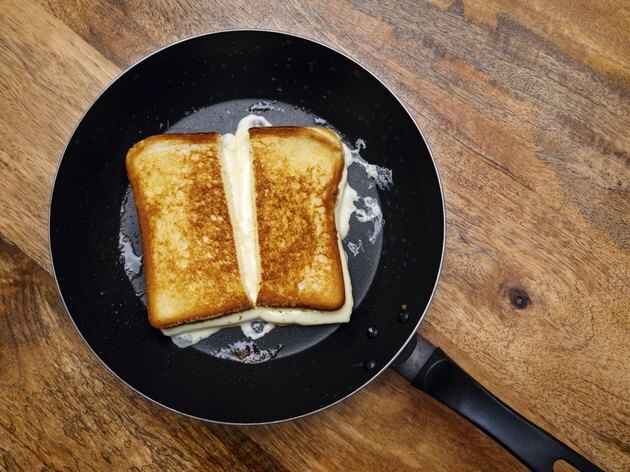 Averaging mozzarella, cheddar, and Muenster, the typical calories range from 30 to 80 calories. MayoClinic.com recommends the average daily caloric intake of adults be approximately 2,000 calories per day. Fats assist your body in absorbing nutrients like vitamins and also aid your immune system. Fats should account for about 20 to 35 percent of your total daily intake, which amounts to 22 to 48 g of fat per day. While Muenster is at the lower end of the fat spectrum with 2 g in a one ounce serving, the other cheeses -- cheddar and mozzarella -- both have 8 g of fat per serving. Vegan cheeses are considered low-fat foods. Carbohydrates are your body's main source of energy. Forty-five to 65 percent of all you daily calories should come from carbohydrates, totalling between 225 and 325 g of carbohydrates per day, based on a 2,000-calorie-pe-day diet. All the vegan cheeses sampled have the same number of carbohydrates per serving -- 2 g, which is not a significant source of carbohydrates. Your fat, bones and muscles all include protein, as well as your blood, hormones, and enzymes. The Mayo Clinic recommends that your daily intake of protein be between 10 to 35 percent of your total calories. Vegan Muenster and mozzarella both include 1 g of protein, while vegan cheddar has 2 g of protein. To supplement a vegan diet to include a denser amount of protein, use your vegan cheese to top beans or legumes. When compared to regular cheeses, or cheeses made from cow's milk, there are some major differences to keep in mind when using vegan cheeses in recipes. Veganbaking.net did a review of different types of cheese, rating them on flavor and "meltiness." Vegan cheeses do not melt the same way as traditional cheeses and the website warns that the texture of vegan cheeses may disappoint you if you're comparing it to dairy cheese. Also, some brands were considered salty, bland or pasty. For the best results, the website suggests melting the cheese at high temperatures.